I have old links, for example the following ones. If users are coming on index.php/event/*, they should be redirected to /event. You can use Match Redirect module. You can write this in any of your custom module using hook modulename_init() function. In your case the argument number may change, please do check and change the argument number. There are Rewrite Rules that can be used to achieve the same thing on drupal 7 as well as on drupal 8. 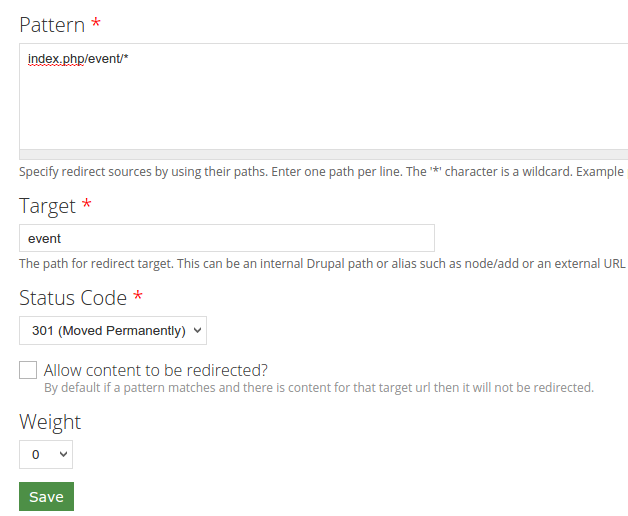 Use this Rewrite Rule in .htaccess file located in Drupal Root directory. Not the answer you're looking for? Browse other questions tagged 7 uri or ask your own question. How do I redirect users visiting a path matching a regular expression? How can I remove old polls/results in Drupal 7? How do I dynamically change the $GLOBAL['base_path'] variable?